Join Our Evolution at Art.Science.Gallery. ! I just wanted to let you know that biocreativity’s partner gallery – Art.Science.Gallery. in Austin, TX – has just launched an exciting crowdfunding campaign on IndieGoGo.com to help us evolve from being a pop-up gallery to a brick-and-mortar gallery! As you probably know, Art.Science.Gallery. is the direct descendent of the biocreativity blog. I decided to open an art gallery that exclusively features science-related art after meeting many of our talented Eco Art + Science Series artists and seeing the amazing work they create! There are a whole lot of science artists out there who need more places to show their work, and thus Art.Science.Gallery. was born! Art is also a great way to get people of all backgrounds interested in the sciences, and we hope our gallery will help increase science literacy by exhibiting science art and by hosting workshops for scientists in science communication and fun art-sci classes for everyone! Making art-science trading cards at Art.Science.Gallery.’s Join Our Evolution Kick-Off Party + Art-Sci Jam at Strange Brew Lounge Side in Austin, TX. In the past year we’ve hosted more than a half dozen exhibitions and events around Texas in collaboration with universities, museums, scientific organizations, non-profits and even churches, and we’re on to the next step in our evolution: our own brick-and-mortar space that will allow us to expand our programs. I invite you all to Join Our Evolution and help our gallery evolve into a community space that promotes art-science fusion of all kinds! A contribution at any level will get your name incorporated into a unique work of science-art that will be on permanent display in our gallery space (+ your name on our website). Other thank-you packages start at only $10! Even if you can’t contribute financially, please help us get the word out by sharing our campaign with friends, family and colleagues via email, social media, or by making a comment on our campaign site: artsciencegallery.com/evolve! We promise to get back to creating great biocreative posts when we’re settled into our new space – and thank you so much for your readership and support of this blog for the past couple of years! You’re fantastic! Join Our Evolution at Art.Science.Gallery.! from h. gillespie on Vimeo. Let’s talk landscape ecology today. And contemporary art. In fact, let’s talk about an art project so big, it’s been over 20 years in the making, and it’s the only one to have ever received a federal Environmental Impact Statement (EIS) required by the National Environmental Policy Act (NEPA). 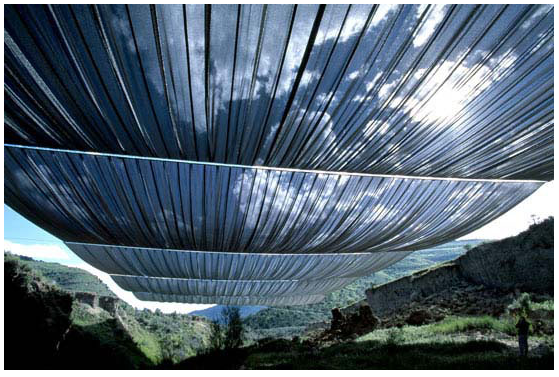 Just last fall, the Bureau of Land Management gave their final approval for the Over The River project, a temporary art exhibition that will suspend 5.9 miles of translucent fabric over a 42 mile stretch of the Arkansas River between Salida and Cañon City, Colorado. Known for their large-scale structure and monument wrappings, artists Christo and Jeanne-Claude first conceived of Over The River in 1992 and have since been working on details of the project, which include an incredibly lengthy design and permitting process. OTR is a curious case-study in environmental policy. The federal EIS conducted for this temporary art project was financed entirely by Christo and Jeanne-Claude, a process that often happens without much public attention when it comes to more routinely-conducted activities on public land. The BLM allows many activities conducted by private entities on public lands including livestock grazing, oil and gas development (including hydraulic fracturing), mining and logging on public lands in the region. Most of these projects have not been subject the level of public scrutiny that OTR seems to have received. Nevertheless, Christo continues pursuit of the remaining permits to make OTR a reality. Christo paid for the EIS at an expense to himself of over $6 million, which was conducted over a 2.5 year period by a team of engineers, wildlife biologists and environmental consultants. The plans for OTR now include scheduling the two-week temporary exhibition to avoid major wildlife migrations, nesting seasons and to minimize noise and disturbance in any one place on the river to a minimum during the construction and take-down process. Christo Over the River, Project for the Arkansas River, State of Colorado, Collage 2007 in two parts: 77,5 x 30,5 and 77,5 and 66,7 cm (30 1/2″ x 12″ and 30 1/2″ x 26 1/4″) Pencil, fabric, twine, pastel, wax crayon, charcoal, enamel paint, hand-drawn topography map, fabric sample and tape. Photo: Wolfgang Voltz © Christo 2007. Despite widespread public support for Over The River, there is some opposition to this project from a small local group which seems to simply not want the temporary art exhibition of this scale in their own backyard. Curious to view the area myself, I drove alongside the Arkansas River on my way to Taylor Park Reservoir, Colorado this summer. As I paralleled the Arkansas, I encountered prospectors searching for gold, anglers hopeful for trout, rafting outfitters guiding the adventuresome, cattle grazing, ATV and motorbike trails, freight traffic, agricultural fields and even quarries. And, if you care to look past the immediate roadside to the adjacent landscape, the list of proposed private uses of BLM land out of the Royal Gorge Field Office (can anyone direct me to the list of current uses?) indeed includes energy trasmission, private development right-of-ways, oil and gas development, coal leasing, mining, cattle grazing and christmas tree harvesting. Why then, I wonder, does the Over The River project seem to have been singled out as a “disturbance of the peace” by a handful of locals? There are certainly activities on our public lands that are much more disturbing to the local ecosystem and to wildlife, including ones with much more long-term consequences than the proposed Over The River project. Is it because Colorado has a long history with mining, fossil fuel extraction, ranching and agriculture? Are these activities therefore more comfortable, commonplace, and acceptable by local residents, despite our current knowledge of how they affect our environment? Is it because art is a much less common use of our public land? Yet, Colorado also has a long and rich history of art, from the artistic traditions of Colorado’s Native American cultures to nineteenth-century geological survey photographer William Henry Jackson and contemporary photographer John Fielder, whose comparative approach to photography has explored how the Colorado landscape has changed since Jackson’s first forays in to the western wilderness (see Colorado 1870-2000). Whatever the reason, just imagine if all activities by private entities on our public lands were held to such a level of public scrutiny as Christo’s temporary art exhibition. It seems that our public lands would be much different places. What do you think? 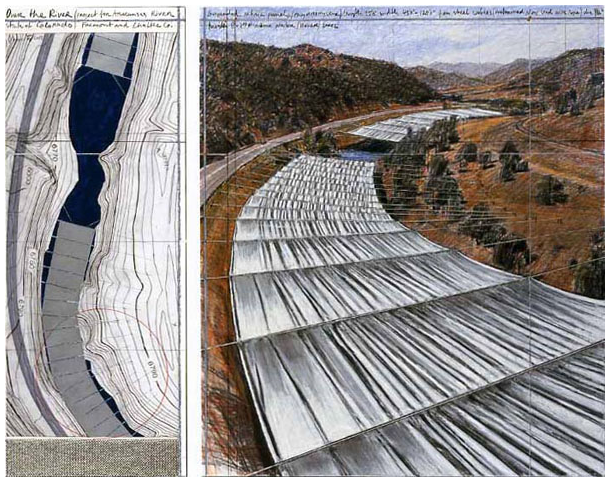 Christo and Jeanne-Claude, however, are no strangers to opposition of their monumental-scale works. “This has happened before,” Christo recently told the Denver Post, “This is a natural process for which we are very familiar.” They seem accustomed to the lengthy permitting processes that accompany their projects, and demonstrate a love of their work, an admiration for public discourse and a level of patience that is itself quite admirable. A recent update from the OTR project page indicates that on-the-ground activities will be delayed yet again, perhaps until August 2015, because of ongoing litigation by a local group against two of the agencies that have approved the project (the BLM and the Colorado State Parks). Now, not to overshadow or under-appreciate the invertebrates (hey, I let them go first today! ), the second piece is from AmphibiaWeb.org in celebration of the 7,000th described species of amphibian. This song, by The Wiggly Tendrils, sings some cool facts about many different species of amphibians. The Atlantic even picked it up in an article yesterday. And, I’m so excited that it features the name of my dissertation study species: Eurycea sosorum! 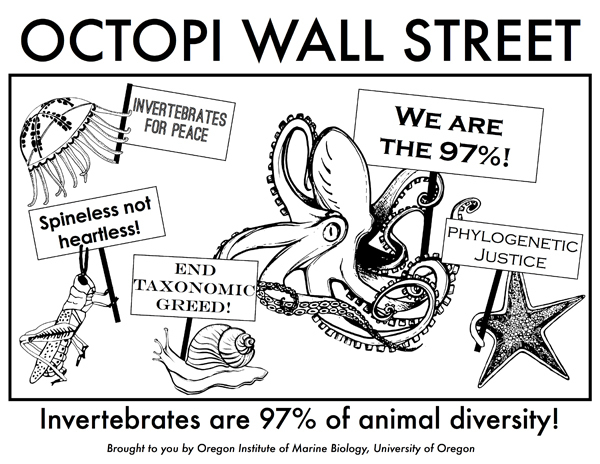 Finally (and I wish I could find a higher res image and a credit for this image), I really enjoyed this poster on the biodiversity of Mexico. It’s just overflowing with incredible diversity of all types of organisms! What other great biodiversity images have you found! ?